To bad (bonds and foreign companies). 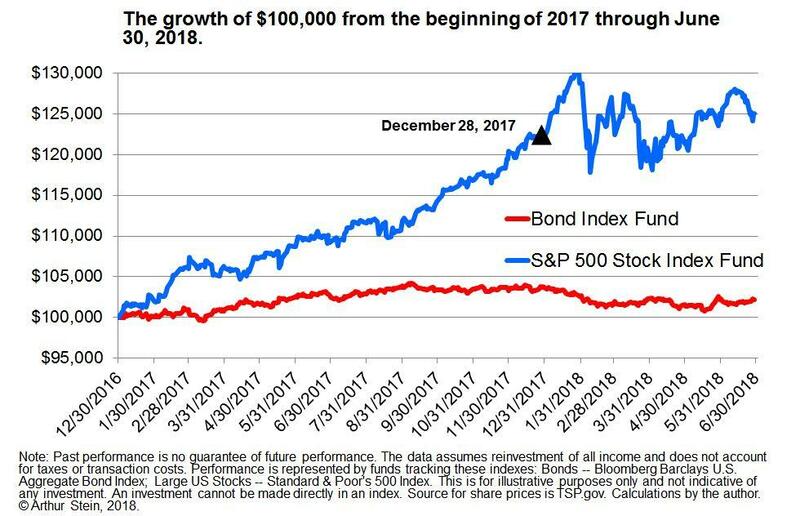 In addition, stock market volatility -- which was missing in 2017 -- returned. The table below details index returns for four categories. Returns include reinvested interest, dividends and capital gains. The tax bill enacted last year boosting US corporate profits. If returns and volatility are keeping you up at night, there are two possible solutions: One, look at longer time periods and two, don't look as often. Is picking a longer time period fair? I think so. Short-term returns are not a useful measure for investments needed 10 years and more in the future. Stocks are a good long-term investment but are not suitable for short-term investment needs. 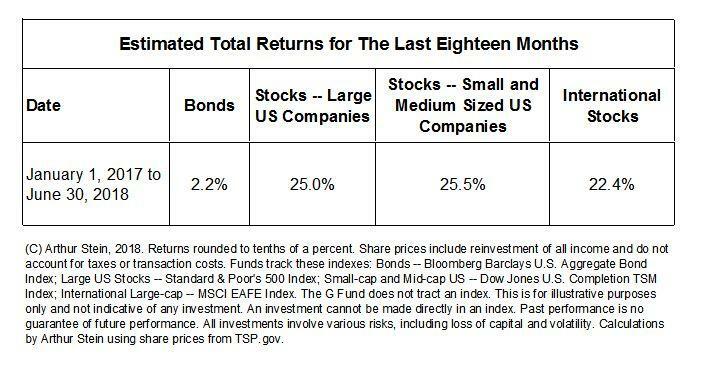 It makes sense to look at long-term returns for long-term investments. How often you review investment values affects perceived volatility. Many investors review long-term investments by looking at short-term returns every day, week or month. In some cases, every hour! That can cause unnecessary despair or euphoria when investment values are volatile. And US stock returns were extremely volatile during the first half of 2018. The following graph traces S&P 500 Index Fund values and lists some of the changes, measured from highest highs to lowest lows. Measured from highest highs to lowest lows, the last six months witnessed the following percentage changes, in chronological order: 7.5%, -9.0%, 8.2%, -7.3%, 5.0%, -3.2%, 4.4%, -1.6%, 3.7%, -3.1% and 0.7%. 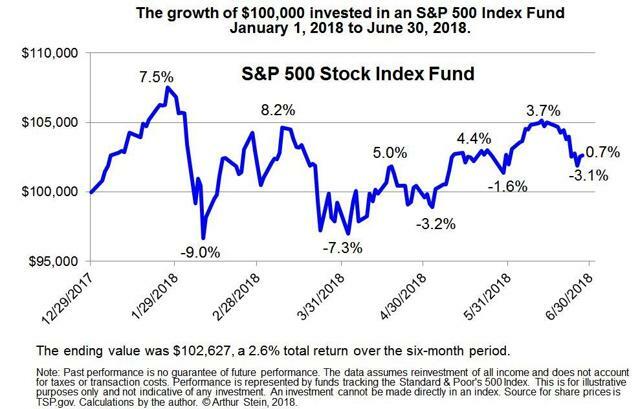 However, at the end of the six-month period, the index fund value had increased 2.6%. Now consider two hypothetical retirees, both of whom started 2018 with $100,000 in an S&P 500 Index Fund and then made no contributions or withdrawals. Ned Nervous looked at his account every day. He saw constant volatility and it scared him. He may be thinking about selling his stock investments. Nellie Not-Nervous didn't look at her account until the end of the six-month period. She doesn't see any volatility, she only sees a 2.6% increase in value. Nellie doesn't understand why Ned is so upset. US stock market volatility in 2017 was the lowest ever recorded. 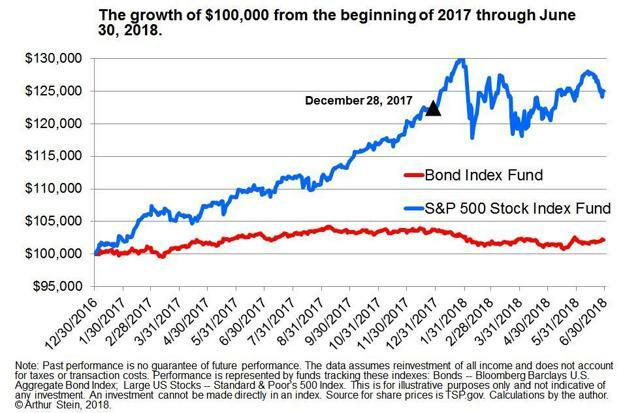 The graph below shows returns for the same index funds in 2017 and first half of 2018 separated by a black triangle). Volatility for the bond index fund was low during both time periods - low when the bond index fund was increasing in value and low when it was decreasing in value. So the higher stock market volatility and relatively low to actually negative returns during of first half of 2018 are quite different from 2017. What changed? Political turmoil in the US, Europe and other parts of the world. An article in The Wall Street Journal stated, "Trade fears have slammed markets around the world, but US stocks are [still] rising as strong profits and spending [in the US] lead investors to overlook the risks of a downturn... Shares of smaller, more domestically focused U.S. firms, which are seen as more insulated from global issues, have…outperformed"
While inflation and interest rates are higher than in the recent past, both are still low by historic standards. According to Peter Lim in the New York Times: "…inflation has definitely ticked upward. The Consumer Price Index rose 2.9 percent over 12 months through June, its biggest increase in six years. That's still below the long-term average of 3 percent. Yet a year ago, consumer prices were growing at a 1.6 percent annual rate. And 12 months before that, inflation was just 1 percent." Does this tell us anything about future returns? I don't think so. One, five and ten year average returns are excellent but we are overdue for a major stock market decline. "Major "meaning 20% or more. According to historic averages, 20% or greater declines (bear markets) occurred every 3.5 years. The last decline greater than 20% was during the Great Recession that ended in March 2009. So we are six years overdue. It could happen sooner or later but investors need to be aware of the risk. In the meantime, this is the second longest "bull market" in US history. If it continues through August, it will be the longest.